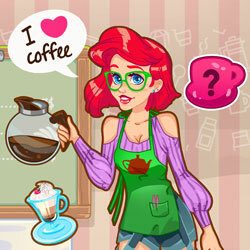 Description: Coffee is a hug in a mug, so help our favorite mermaid prepare the most awesome coffee in the world. At first, the shop will be a bit empty, you'll need to gather coins, in a limited time, in order to buy ingredients for all the types of coffee recipes. And then, serve the coffee to all the customers who come to Mermaid Coffee Shop.